Whether you're working on a shoestring or with feature film budgets, every production is under pressure to save money. And while cutting back on crew and downgrading your gearlist are effective ways of reducing costs, they invariably also reduce production value. But you can make big savings simply by being organised. Time really is money in the edit suite and I'm always surprised at how much of it is wasted. My top tip for saving time (and money) in post is to make sure that you plan well beforehand, so that all you do in the edit suite€¦is edit. Here's how to make that happen. 1. Get advice - it's free! Getting input from the right people, early on helps ensure that you can deliver what you pitch. Everyone, regardless of experience, needs a bit of advice now and again, particularly when considering the speed of technology changes and the effect this has on our industry. The technical operators, post-production supervisors and creative talent that you plan to work with are undoubtedly experienced professionals and they have a vested interest in making sure that your production runs smoothly - let them help you! 2. Ignore delivery specs at your peril Your broadcaster's spec can have a big impact on your budget and schedule - don't just expect your post house or internal facility to take care of it. Make sure that you understand what you need to deliver before production starts - discovering that you're expected to provide multiple masters, each with different technical specs and rights clearances, on the last day of post can be devastating. 3. Think "contingency" On average, post-production accounts for around 20 percent of initial production budgets. But this is often whittled down to as little as 10 percent after overspends during the production phase. Include contingency time and money in your planning to make sure you don't run out before the edit - and to cover the inevitable issues that you'll decide to "fix in post." 4. Don't forget the two F's Inconsistent frame rates and formats can derail your post-production. Discuss and agree on the format and frame rate you want to work with, and make sure that the camera team and data wrangler are informed before you start shooting. 5. Plan your media management You'll waste less edit time searching for shots if you've planned how you want your media organised early on. Do you want all the footage shot by a specific crew to be stored in a single bin or would you prefer to organise your media by shoot location? Make sure the crew knows what metadata you need and what naming conventions to follow and that the data wrangler and facility know how you want your files organised. 6. Delay the wrap party Review your footage as soon as possible - ideally before you wrap. Not only will you be better prepared for post if you're familiar with your footage, but the earlier any issues are identified, the easier it is to solve them. It's cheaper to run into overtime on a shoot than it is to book a reshoot. 7. Reduce the time spent searching The more information you can bring into edit, the better. Logging your footage before the edit means that you'll be able to search for key words and find specific shots in seconds - a crucial step for high-shoot-ratio productions. Smaller productions can get away with basic clip tagging or even paper based logs. 8. 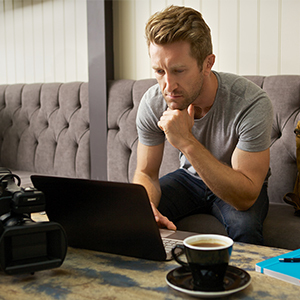 Start editing before you get to the suite Take advantage of cloud-based services like Forscene to start selecting shots and creating rough cuts before you get into the edit, or to collaborate with your post-production team while working remotely. 9. Review the way you do reviews Reviewing edits in the edit suite is expensive and almost impossible to co-ordinate. Making review copies of your edit available online lets clients, execs and broadcasters give input without leaving their desks and saves valuable edit time. But even remote reviews need to be scheduled so that your editor isn't left twiddling their thumbs while you wait for feedback. 10. Don't make audio an afterthought Sound makes a huge difference to your final programme and needs the same consideration and preparation as the visual elements. If you're cutting to music, spend time before the edit choosing the tracks (or similar references) so that the editor can cut to the pace and style of the piece. Make sure you record and log atmospherics and other audio elements so that they can be found and used in the edit, and brought to life in final mix. It could be the difference that turns your shoulder peak ob doc into an RTS nomination. Max has 19 years of experience in television production, post and facility management. As part of the Discovery EMEA programming team he has worked on some of the most memorable factual content to come out of the UK and US, including shows like "Raising the Mammoth", "Deadliest Catch" and "American Chopper." Over the last four years he managed two of the U.K.'s largest post-production facilities; Clear Cut Pictures and Crow TV.